Lovely novelty books which explore first experiences through charming pictures, chunky tabs and simple four-piece jigsaws. Take the fear out of a visit to the doctor, and learn how to welcome a new baby! Helping children to prepare for new experiences while they improve their reading skills, these delightfully sturdy and colourful board books are a must for any home library. 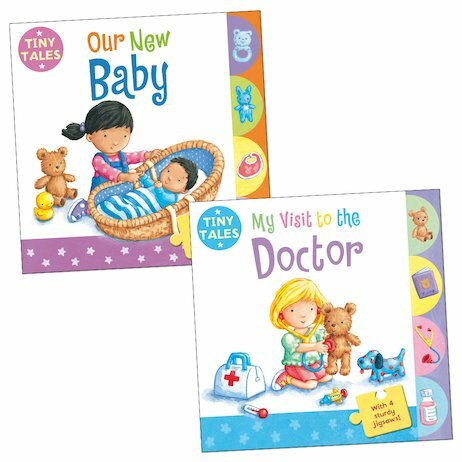 Beautiful pictures introduce plenty of fascinating details for tots to spot and talk about, while each simple story clearly shows children what they might expect in the featured situation. The appealing stories lead to reassuring endings designed to smooth over common anxieties, letting small children resolve their worries as they solve the fun jigsaw puzzles!